Feast (AKA Ritual in the UK) by Graham Masterton is hands down the creepiest, most disturbing horror novel I have ever read in my life. I first discovered and read this novel in the summer of 2006, and I think about it on a regular basis. I even decided to keep this copy for my personal collection. In Feast, a restaurant critic named Charlie travels to a sleepy Connecticut town with his young son Martin for business. As Charlie spends time in town, he begins to notice that not only do the town's residents behave strangely, but they are also missing various limbs from their bodies. Soon enough, Charlie's son Martin goes missing, and Charlie has no doubt that the creepy townsfolk are involved with his disappearance. Charlie then embarks on the journey to find and save his son - and discovers that he has become entangled in the most unimaginable nightmare. And I when I say unimaginable, I really do mean UNIMAGINABLE. Anything else I reveal about the plot from here on out will indeed spoil the outcome for future readers of this novel, and of course, I wouldn't dream of doing that. 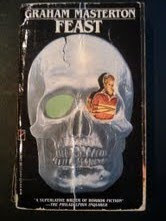 However, I will say this: Feast is the most disgusting horror novel I've ever come across, with Chuck Palahniuk's Haunted at a close tie. As I read Feast, I had to put the book down several times because I was legitimately gagging, and none of my friends or family would allow me to discuss the book with them because it was so gross. Yet, this is exactly what I loved about the book, and it was truly horrifying, and thrilling. The book was written in 1988, but its horror elements are not at all time-sensitive. If you can get your hands on a copy, DO IT! It is well worth your time! My other favorite horror novels by Graham Masterton are Prey, Master of Lies, and Death Mask. Click on any of the book images below to review them in more detail on Amazon.com. What are the nastiest horror novels you've ever read? What books have truly made you sick to your stomach? Share your comments with us below. I must track this down! The cover art is awesomely '80s too. Yes! You must find a copy! I love cheesy 1980s horror novel cover-art. Sometimes I'll buy horror novels I've never heard of from thrift stores just because they have neat cover-art. Sometimes you find great horror gems that way!